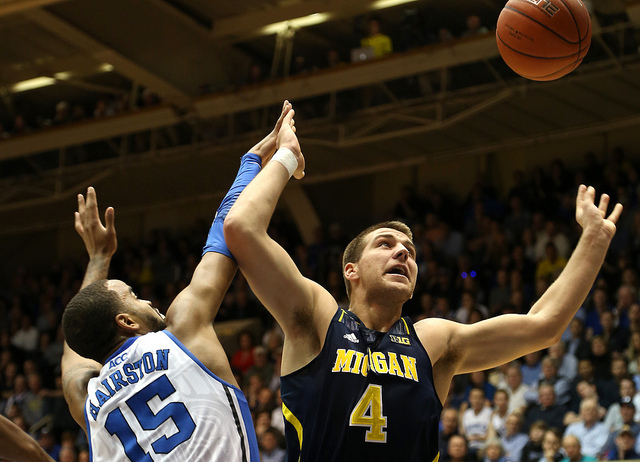 Michigan’s Mitch McGary, the alliterative forward who played two years that were hampered by injuries, just declared for the NBA Draft, where he is likely to fall to the bottom half of the first round. Originally, McGary was headed back to school for another season — a common strategy for a talented player who had a disappointing year and wants to improve his draft stock. That was before he was made aware that he’d have to wait until the 2015-2016 season to play college ball again. What? According to McGary, who had been sidelined for most of the season, he drank some beer and had smoked some pot in the middle of March. A couple weeks later, he was drug tested by the NCAA, despite the fact that he still hadn’t played a minute of basketball in the interim (although he was dressed). He tested positive. ” I could point out,” Colas continued, “that perhaps the humanity he has shown, in class and in smoking a joint, might actually be an integral part of (rather than some unfortunate obstacle to) what made him so effective and thrilling as a basketball player.” The 2014 NBA Draft will take place on June 26.